Gaius Vibius Volusianus was the son of the emperor Trebonianus Gallus whose life, reign, and fate he shares. He was born into the family of a well invested senatorial family, probably around 235 or later. His fathers career was standard cursus honorum mixing military and political appointments of greater and greater importance. He served in the senate, he served as consul and by 250 AD, he was governor of Upper Moesia, a roman province situated in the Balkans along the banks of the Danube river. At this time there was crisis in the empire and chaos on the Danube. Gallus was forced to defend against attacks from the Goth tribes who had taken to raiding and pillaging the territory. These tribes were making aggressive moves partly due to payments promised by the emperor Maximinus Thrax but discontinued under the emperor Philip (the Arab). These repeated incursions forced the hand of the emperor Decius and his son and co-ruler Herennius Etruscus who traveled to the Danube regions to deal with the Goths personally. Gallus supported the emperor repelling Goth attacks around Novae. After initial success, the Roman force was attacked by surprise and Decius was forced to withdraw. Decius re-organized and returned sometime in June of 251 accompanied by his son Herennius Etruscus and Trebonianus Gallus. Romans and Goths clashed again at the Battle of Abrittus where Roman troops under the command of Decius and Herennius would be drawn into swampy areas and suffer a crushing defeat. The idea, as stated by Zosimus, that Trebonianus Gallus may have been in collusion with the Goth leader Cnivia and this helped bring about the death of Decius is unlikely. With Decius died a Roman emperor along with many roman soldiers at the hands of a barbarian hoard. It is unlikely a man even suspected of being the cause of such a disaster would be raised by the troops. Even so, on the death of the two Augustii, Gallus was proclaimed emperor by the troops. As is so often the case, he was not the only claimant. Hostilian, the younger son of Decius who was still a child, was presented as his fathers rightful sucessor. He was proclaimed emperor by his supporters in Rome and would rule under a regent. Possibly to avert a civil war in a time of crisis, or possibly out of genuine respect for Decius and his family, Gallus adopted Hostilian and accepted him as co-emperor and elevated his son Volusianus to the rank of Caesar and Princeps Iuventutis (prince or first of youths). This arrangement would last only about a month. Gallus made an inglorious retreat from the Danube agreeing to annual payments in exchange for peace. From there he traveled to Rome and found it suffering from an outbreak of the plague. Not long after his arrival, the young Hostilian contracted the illness and joined the ranks of the very few emperors of this time period to die a natural death. Gallus, now sole emperor, raised Volusianus to the rank of Augustus sometime in late 251. Although the young Volusianus was now co-emperor, there could be little doubt that his father was calling the shots. His date of birth is not known thus his age cannot be pinpointed exactly. It seems likely that when he appears as Caesar to his fathers Augustus, he was in his mid to late teens. When his father was proclaimed emperor, he was given the title of Caesar and Princeps Iuventutis. Although the title Caesar can be bestowed on an heir and potential sucessor at any age, the title Princeps Iuventutis, or prince among the youth, is a title bestowed upon the young. Just that year Volusianus was given both titles thus it is safe to say he was still at an age where he would be considered a youth. It seems probable that a full grown man would not be given such a title nor would a man retain it once he reaches adulthood. It seems likely that he was less a child and more a young man as he appears bearded on his coins, reminiscent of the later portraits of the young emperors Geta or Severus Alexander. This is in contrast to the portraits of his contemporary Hostilian who was known to be a child and appears as such on most of his coinage much like the child portraits of Geta, Caracalla, Gordian III and others. If Volusianus was a younger child he would have been depicted as such on his coins. It seems highly likely he was a young man of about 16 (give or take) when he became his fathers Caesar. Gallus inherited all the woes of a faltering empire and problems on all fronts. Rome was suffering from an epidemic and Gallus was initially successful in gaining popular support with his humane treatment of the victims. It soon became apparent that in most other matters, he was ineffective at best. The Persian Emperor Shapur I entered the province of Syria with only token resistance from Roman forces. Gallus either did not, or could not prevent Persian forces from invading the province or defend Antioch, its capital city. By 253, Antioch was taken and most of Syria was under Persian control. It was around this time that the tribes on the Danube were again flooding into Moesia, possibly in retaliation for Rome's failure to pay the promised tribute. It is uncertain if Rome did not pay, or if the payment was kept by the new governor of Upper Moesia, Aemilius Aemilianus, as either promised reward for victory against the Goths or loyalty in his bid for the imperial throne. Regardless of the reason, Aemilianus engaged the invaders and defeated them. After this victory, his troops proclaimed him emperor. Whether Aemilianus had seditious intentions and orchestrated these events, or he was simply doing his job and proclaimed emperor by loyal troops is not known. Once he was proclaimed emperor he wasted no time marching on Rome to solidify and legitimize his position. Finally spurred into action, Gallus and Volusianus marched towards Moesia to deal with the usurper. Aemilianus marched to Rome to assert his right to rule. Some time in August 253, the two forces clashed near Interamna Nahars, close to the southern terminus of the eastern branch of the Flaminian Way. The armies may have been relatively even in size. Only if these forces were even would both sides so willingly engage. If one side was much larger, the smaller would be far less likely to leave a defendable position and fight unless they were in a very advantageous position, expecting reinforcements or incompetent. The armies were most likely smaller groups of professional soldiers in the pay of Rome. Governors and generals on the frontiers were in command of large, often scattered, armies more loyal to their commanders than someone sitting in Rome. It is doubtful, given recent events in the province, that Aemilianus would leave Moesia without adequate defense. It is more likely he brought what he thought he could spare and what he thought he would need. He would not have marched on Rome against a far superior force. Gallus and Volusianus may have had trouble fielding larger numbers. The borders were a war zone and they required significant manpower and resources. The empire could not afford to keep significant forces stationed in Rome while the borders are overrun. 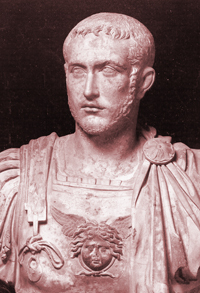 Generals and governors like Aemilianus needed these men to defend the empire. Gallus probably fielded what forces he could muster in the immediate area and those he could recall quickly. Whatever the sizes of the competing forces, Aemilianus probably entered the fray with an advantage. His men followed a general and emperor of their choosing. A man who stood up to the barbarians who were looting the province, who just recently led them to victory in battle, and brought a semblance of security. On the other hand, the actions (or inaction) of Gallus and Volusianus were not so inspiring. They had entered into a hasty and humiliating agreement with the barbarians choosing to pay them off instead of engaging them and did little to defend Syria from the Persians. Only when it became apparent that their rule and life was in imminent danger by a usurper did they take decisive action and by then it was probably too late. When the dust settled Aemilianus had won the day. Gallus and Volusianus were forced to retreat then murdered by their personal staff (domestici) at the Forum Flaminii. At the time of their deaths Trebonianus Gallus was about 47 and Volusianus was probably in his late teens or early twenties. There is precious little information regarding Gallus and even less concerning Volusianus save that he seemed to follow his fathers lead. Because he was his fathers co-ruler, because they met their fates together, because his father was in control and he so young, the story of Volusianus and Gallus will forever be intertwined. Their reign is characterized by relative inaction during a time of crisis that required bold, decisive action. It is unknown whether this inaction was a sign of unwillingness to face these problems or if they were simply unable to muster the men and resources to act quickly and decisively. With enemies invading multiple provinces and a large volatile border requiring strong defense, there was probably little room to maneuver when facing civil war. This constant civil war and the use of barbarian soldiers with ever changing loyalties would help destroy the empire in the end. It could have been incompetence. It could be that these two men were simply not up to the challenge like so many who came before and would come after. It could be that we confuse inability with unwillingness, less incompetent than simply overwhelmed and with limited options.